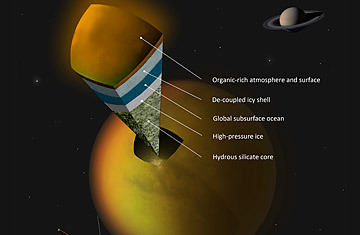 This artist's concept shows a possible scenario for the internal structure of Titan, as suggested by data from NASA's Cassini spacecraft. It really is a shame that Titan can't slip away from Saturn late one night. The ringed planet's most interesting moon would easily qualify as one of the solar system's most interesting planets if it were out and orbiting on its own. Still, even as a mere back-bencher it does just fine. Titan has long been thought of as something like a flash-frozen version of the early Earth, saturated with the hydrocarbons that first made life possible on our planet. Getting a good, close look at Titan is thus like getting a good close look at our own distant past. Just two weeks ago, data from the Cassini spacecraft, orbiting Saturn, also revealed that Titan's surface is home to numerous methane lakes, one of them half as large as Utah's Great Salt Lake. Now comes a paper published in the journal Science persuasively suggesting that Titan probably has a vast-globe-girdling ocean beneath it's surface too, and unlike the methane-filled lakes above, this one is made of ordinary water. That has very big implications not just for our understanding of Titan, but for our hunt for life elsewhere in the cosmos. "The search for water is an important goal in solar system exploration," said lead author Lucino Iess, a Cassini scientist at Sapienza University in Rome. "Now we've spotted another place where it is abundant." An ocean within Titan was never going to be easy to detect  and not just because it's buried beneath the surface. Jupiter's moon Europa has a buried ocean too, but it has no atmosphere, which means its surface  which is a thick rind of water ice  is readily visible, serving as a first suggestion of the liquidity beneath. Titan, by contrast, is completely hidden from view beneath a thick, opaque atmosphere. Instead of relying on their eyes, the Cassini scientists thus relied on what's known as tidal flexing. Cassini's 16-day orbit around Saturn is not completely circular. During its closest approach, it elongates slightly as it's squeezed by Saturn's powerful gravity; when it's farther away, it grows rounder  though never completely spherical. During six flybys of Titan from 2006 to 2011, Cassini gathered radio-metric tracking and optical navigation data from which investigators could roughly infer the changing shape of the moon. They then combined it with existing reference readings from the Pioneer and Voyager flybys decades ago. From all of this, they could determine that at maximum gravitational squeezing, Titan bulges at its poles by about 30 ft. (10 m), and then relaxes again at minimal squeezing. That doesn't amount to much on a moon that measures 3,193 mi. (5,139 km) in diameter, but it's a lot more consequential than it seems. The deformability of a world is determined in large measure by its composition, and that's measured by what's known as a Love number, a lyrical term that's actually rather prosaically derived from mathematician Augustus Edward Hough Love. In the early part of the 20th century, Love developed a formula to measure how dramatically Earth is deformed by its own tides, but the method can be applied to any cosmic body. A completely solid world would have a Love number of zero. A completely liquid one would be 1.5. The team that conducted the Cassini study calculated a Love number of about .6 for Titan. "The density of Titan is consistent with a body that is about 60% rock and 40% water," says planetary scientist Jonathan Lunine, of Cornell University, one of the co-authors of the paper. "The ocean must be fairly thick  a few hundred kilometers. And it must lie relatively close to the surface  beginning no farther down than 100 kilometers." In theory, of course, the solid and liquid components of Titan would not have to be rock and water. The Love number tells you only the solid-to-liquid ratio and as Lunine himself admits, all other things being equal, Titan could be made of diamond and methane. But all other things aren't equal. "It's a matter of what's abundant in the solar system," he says. "Water is far and away one of the most abundant substances. Europa, as well its sister moons Ganymede and Callisto are covered with water ice like Titan. Rock and metals are similarly plentiful. All this hangs together to suggest what the interior of Titan is like." But why wouldn't the ocean be frozen straight down to its silt? There's hardly enough solar warmth 869 million mi. (1.4 billion km) away from the sun to keep water melted. This too can be explained by tidal flexing. In the same way that a wire hanger that is bent rapidly back and forth can quickly become too hot to touch, so too can a moon that is constantly stretched and squeezed begin to cook from within. The four great Jovian moons are constantly deformed not just by Jupiter but also by their respective gravities as they pass one another while speeding along their different orbital tracks. On Europa, Callisto and Ganymede this means subsurface liquid water. On much drier Io, the innermost of the group, it means explosive volcanoes. Titan has no equally large siblings gravitationally plucking it the same way, so its tidal heat would not be quite enough to keep water meted. But deeply buried radioactive elements, plus leftover heat from the moon's original accretion would help things along. "All that gives you enough heat to rationalize the existence of the ocean," says Lunine. Whether that ocean could contain life is impossible to say. The only way to know for sure would be to land on Titan and collect samples either of the rind of surface ice or  much better  of the churning water far beneath. Clearly, we are a long way from mounting such a mission at the moment  though less because of the technological challenges than the fiscal ones. When we do have both will and wallet to make exploratory trips to watery worlds, however, the new study gives us one more intriguing place to which to dispatch our ships.